10 YEARS OF THE BRANTRY FLEADH! The weekend of 3rd-5th August will see the return of the Brantry Fleadh 2018. Headlined by Cara Dillion, Flook, and ZoDoMo, it is supported by the Mid Ulster Council, Arts council NI and Comhaltas Ceoltoiri Eireann. This significant annual event now in its 10th consecutive year takes place at The Brantry Bard Cultural Centre, near Dungannon, Co Tyrone, and reflects all things positive about the traditional and cultural arts, through a series of concerts, music sessions, workshops, song and dance, lasting into the wee small hours! The Fleadh commences on Friday 3rd August with an evening of song featuring the brilliant Cara Dillion, returning to the Brantry Fleadh for the second time in recent years. This extraordinary Irish singer has been captivating audiences and achieving exceptional acclaim for over 20 years. She has (according to Mojo magazine) “Quite possibly the world’s most beautiful female voice” Cara will be supported in song by local Tyrone man Niall Hanna, a traditional/folk singer and guitarist from Derrytresk on the shores of Lough Neagh. Niall has been immersed in traditional singing from a young age, a legacy left behind by his grandfather Geordie Hanna and his sister Sarah Ann O’Neill. On Saturday 4th August there will be Traditional Music and Song Workshops under the guidance of some of Irelands leading Traditional Musicians; Brid Harper & Zoe Conway (Fiddles), Darren Breslin (Accordion), Brona Graham (Banjo), Louise Mulcahy (Flute), Brian Finnegan & Deirdre Havlin (Whistles), Ed Boyd (Guitar), John Joe Kelly (Bodhran), Michelle Mulcahy (Harp), Ciaran Hanna (Concertina), Gay McKeon (Uilleann Pipes), & Niall Hanna (Traditional Singing). The workshops will be followed by Flook in concert, who weave and spin traditionally rooted tunes into a breathtaking sound. This group possesses a rare blend of fiery technical brilliance, delicate ensemble interaction and a bold, adventurous musical imagination. Flook will be supported by the Mulcahy’s of Abbeyfeale, West Limerick. Mick, Louise and Michelle Mulcahy play a dazzling array of instruments between them but it’s the sweetness and tunefulness of their ensemble playing that is most striking. They have an unmistakable, infectious sound and their skill and enthusiasm comes from a lifetime of playing together. Sunday 5th August commences with the ‘Lap the Lough’ charity fun run. This will be followed by the ‘auld Sunday dinner’, and children’s fun day at the Bard Cultural Centre. The afternoon will see our very popular Sets Ceili, with music performed by the 2017 2nd place All-Ireland winners The Blackwater Ceili Band. The weekend will conclude with ZoDoMo in concert. Described by critics as a “trad music supergroup”, the trio features three of Ireland’s eminent musicians, Zoë Conway, one of the country’s most gifted virtuoso musicians who is equally at home in both traditional Irish and classical styles. Dónal Lunny, popularly regarded as having been central to the renaissance of Irish music over the last three decades and Máirtín O’Connor, a master musician whose dexterity and innovation has won him worldwide acclaim. ZoDoMo will be supported by Gay McKeon and Liam O’Connor. Both were born into prominent musical families in Dublin. Between them they have received many musical accolades and both were awarded the prestigious TG4 Young Musician of the Year. In 2009, the pair released a duet album entitled “Dublin Made Me”, to great acclaim. 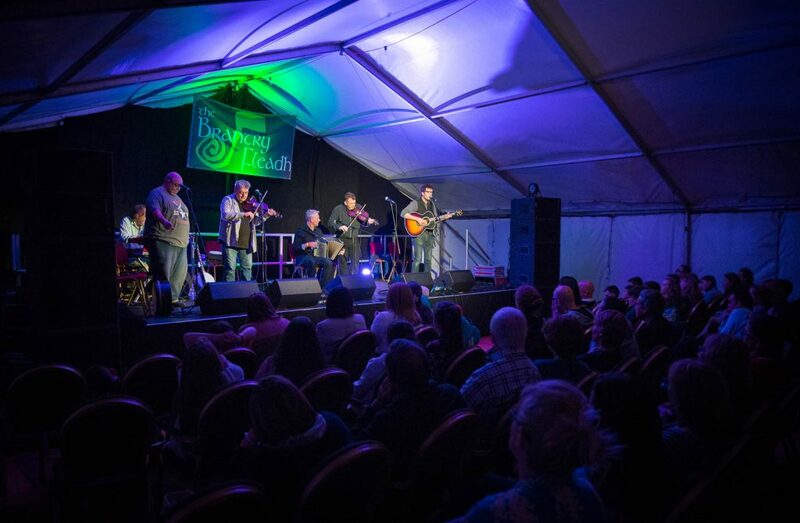 The Fleadh will draw to a close as always with a monster session into the wee hours! A weekend not to be missed! Tickets are available online at Eventbrite, www.brantryfleadh.com or at Gene Stuarts Music Shop, 9 Irish Street, Dungannon Tel: +44(0)28 8772 5286. Booking in advance advisable! Further information on the Brantry Fleadh 2018 is available on: www.brantryfleadh.com / T: +44 (0) 7771 607 840 / Email: info@brantryfleadh or follow us on Facebook!